Nestlé UK and Ireland has unveiled Milkybar Wowsomes, the first chocolate bar in the world to use Nestlé’s innovative sugar reduction technique. Nestlé researchers made a scientific breakthrough when they transformed the structure of sugar through a newly developed process using only natural ingredients. Inspired by candy floss, experts created aerated, porous particles of sugar that dissolve more quickly in the mouth. This allows someone to perceive the same level of sweetness as before while consuming less sugar. With the help of this new technology, Milkybar Wowsomes has 30% less sugar than similar chocolate products and contains no artificial sweeteners, preservatives, colours or flavourings. Milkybar Wowsomes has milk as its number one ingredient, contains crispy oat cereal pieces, is a source of fibre and is gluten free. The range has products in a number of different sizes for different occasions and the largest sized bars are 18g and have 95 calories each. The achievement is all the more impressive as it has taken little over a year for Nestlé teams in Switzerland, the UK and the Czech Republic to take the scientific and technological breakthrough and turn it into a new confectionery product. Milkybar Wowsomes will appear in stores across the UK and Ireland in the coming weeks. “It is with great pride that the UK and Ireland becomes the first market in the world to use this exciting technology to create such a great tasting confectionery product. We have an unrivalled research and development network and the experts at our Product Technology Centre in York have been instrumental in this breakthrough. Teams across our UK business and around the world have been working incredibly hard to make this launch a reality. “The ambition behind Milkybar Wowsomes was enormous and it has been a real challenge for us to get to this stage. To create a confectionery product in just 12 months which has 30% less sugar than similar chocolate products and contains no artificial sweeteners is extraordinary. We have also made sure that our largest individually wrapped product contains 95 calories per bar. 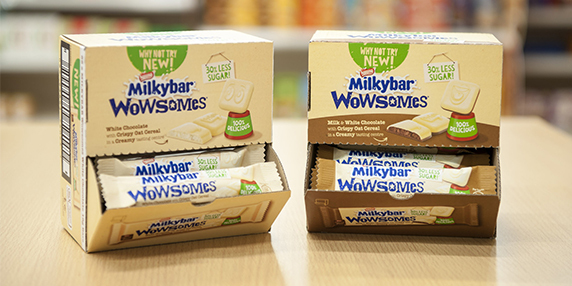 Milkybar Wowsomes is an entirely new product under the Milkybar brand and will be available in single bars, multipacks and a stock-up bag with individually wrapped single pieces. It comes in two variants, white chocolate and a combined milk and white chocolate. Each piece is made of smooth white or white and milk chocolate and has a creamy-tasting centre containing crispy oat cereal pieces. Milkybar Wowsomes will begin to appear for sale in all major retailers across the UK and Ireland from next week.